“saddest and most moving piece of rock in the world”, Lucerne, Switzerland. 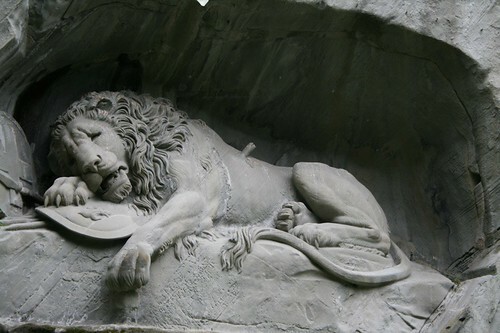 Bertel Thorvaldsen’s famous carving of a dying lion (the Lion Monument, or Löwendenkmal) is found in a small park just off Lowenplatz. The carving commemorates the hundreds of Swiss Guards who were massacred in 1792 during the French Revolution, when the mob stormed the Tuileries Palace in Paris. More information can be found at everything2.